A load-through hatch is located on the rear bench seat behind the centre armrest. It can be used to transport long objects, such as skis, inside the vehicle. To prevent soiling the vehicle interior use an item such as a blanket to wrap any dirty objects before pushing them through the load-through hatch. 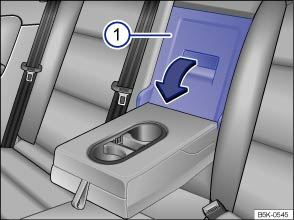 Do not use the middle seat on the rear bench seat to transport passengers when the centre armrest is folded down. Fold the centre armrest forwards . Pull the release lever in the direction of the arrow and fold the cover of the load-through hatch all the way down. Push the long objects through the load-through hatch from the luggage compartment. Secure the objects with the seat belt. Fold back the cover to the load-through hatch until it clicks into place. The red marking on the luggage compartment side should no longer be visible. If necessary, fold back the centre armrest. The load-through hatch can also be opened from the luggage compartment. 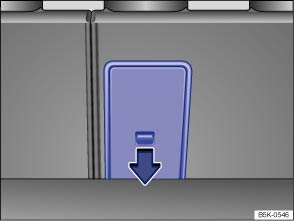 Push down the release lever in the direction of the arrow and push the cover forwards .